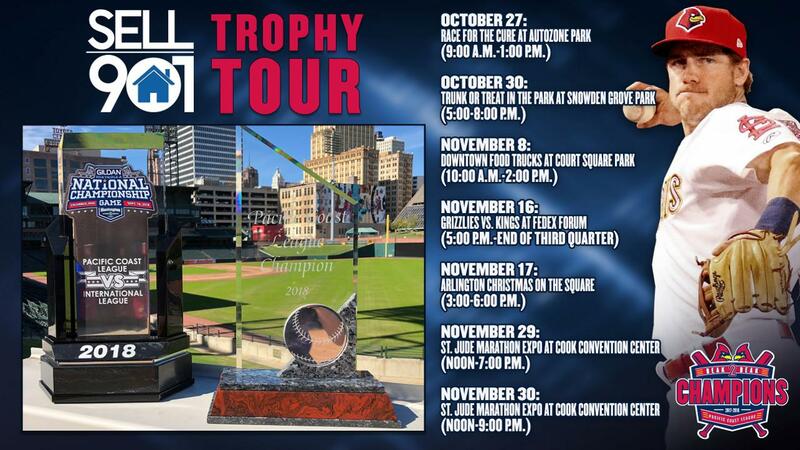 MEMPHIS, Tennessee - The Memphis Redbirds are packing up their brand-new hardware to tour the region on the Sell901 Trophy Tour, where fans can see and take pictures with the 2018 Pacific Coast League and Triple-A National Championship trophies. Each tour spot is also scheduled to feature the chance for fans to win prizes, meet Rockey the Redbird, and more. While certain stops on the Sell901 Trophy Tour may have admission fees, there is no cost to see and take pictures with the trophies. The Redbirds claimed their second-straight PCL title and fourth in franchise history in Sept. and went on to win their first Triple-A National Championship with a 14-4 win over the Durham Bulls, the champions of the International League. The Redbirds went 83-57 in the 2018 regular season after going 91-50 in 2017. The 174 wins between the last two regular seasons are the most for Memphis professional baseball teams since also winning 174 games in 1933-34.